Remember to begin with your shoulders lower than the person you are guarding. We call this the shoulders game. By keeping your shoulders lower at the start and then continuously throughout the penetration and drive, you are more likely to get to the spot before the offense. Do not begin too close or too far away from the offense. If you are too close, they will drive by you. If you are too far, they will SHOOT The best thing is to begin at least an arm's length away. It is appropriate to reach out to your defender if you are not sure whether you are far enough away. Never forget your footwork. Taking long steps often will hinder your progress while defending drives. Take shorter, choppier steps and remember to "push-pull" off your front foot. Another key is to have active hands. While on the ball your hands are busy, but you must also remember to use your hands while defending the penetration. Use a "deflection hand" high and a "ball hand" low and up on your defender. A lot of coaches will call this "riding" a player out. While you are defending the drive, try to poke the ball out with your ball hand, and then use your deflection hand to block passes or quick shots. Another important hint is to never hit down on the ball. When you swing down on the ball it is a more aggressive motion and more likely to get attention from the officials for a called foul. Swipe up on the ball. The most successful defenders will have strong CORE MUSCLES. Your hips, abs and buttocks will be strong and help you be balanced and able to move quickly in lateral motions. Jumping rope will help your foot speed. The best way to become a great defender, of course, is to know your opponent. Watch film and read scouting reports. The best defender is the smartest defender. Here are some notes and drills from a defensive clinic given by Duke’s Mike Krzyzewski. 1. A winning basketball team makes the opponent react to them, whether they are on offense or defense. 2. Our philosophy is to attack on defense. 3. Don’t be afraid of making a mental or physical mistake on defense. The only mistake you can make is not playing hard. 4. We do so much defensive breakdown work that they develop good defensive habits. 5. Our defensive involves getting all five players to play together: talking on defense, seeing the ball, and moving as the ball moves. 6. Play for the charge. 7. Defense continues until we get possession of the ball. 2. Zig Zag and pick up the dribble-Defense now traces the ball in a dead situation. 3. Zig Zag to mid-court then keep the ballhandler to the outside like you would in half-court defense. 4. Zig Zag influence drill–drop back to midcourt, then make fake traps and influence the ballhandler to the side. fake a trap of the ballhandler if he drives. The offense moves the ball and the defense works on denials, slides, and positioning. I am going to talk about the different techniques to defend the middle pick & roll. In my opinion, a middle pick & roll is anything set from the free-throw line extended and above. I also believe there are two different types of middle pick & rolls: Flat and Angled. (See Images Below) Additionally, each type of pick & roll can be guarded differently depending on personnel and game plan. Over the last several years I have learned a term/concept that is widely used in the NBA, “Weak”. “Weak” means the defense wants to push the ball handler to dribble using their left (usually Weak) hand. Many teams use this concept regardless if the ball handler is right handed or left handed as 9/10 times they will be right handed. Additionally, if you are always pushing the ball handler the same direction, the rest of your defense will know their rotations every time. I believe this is a term that most middle and high school coaches could implement into their game plan on on a nightly basis. Note: this typically should only be used in the middle of the floor. In my experience, there are five ways to effectively guard an angled middle pick & roll: Level, Jam, Show, Blitz, and Switching. 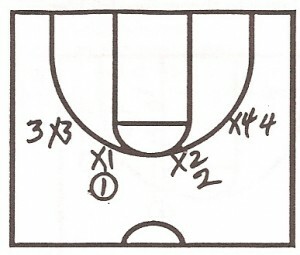 Note: these can be utilized in any middle pick & roll situations. 1. Level: Leveling is a very similar concept to “Weak”. However, you are not forcing the ball handler to one direction. Rather your big simply levels off the screen to prevent the guard from turning the corner. This also prevents the defense from getting burned if the ball handler turns down the screen. The big sits back and waits until the guard comes off of the screen before he takes action. 2. Jam: Jamming is a very popular term that I am sure most of you already use. Jamming has also been called “Lifting” as it might be a better name for teaching the technique. As the game has progressed and officials are now calling more and more touch fouls, Jamming is turning into more of a “Hug Up & Under” technique; so this is the technique I will describe. Typically it is easiest to Jam a screen when the big is stationary and NOT sprinting into the pick. 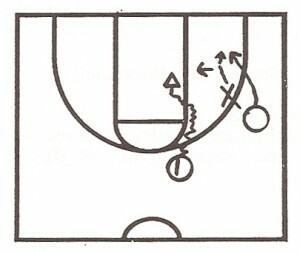 As the ball handler is approaching the screen, the defender hugs up against the picker and attempts to move the screen up (without fouling) as the guard sprints underneath. Note: this technique should not be used if the ball handler can shoot as it is easy to stop and pop behind the screen. 3. Show: Showing should be used when you want to slow down the guard coming off the pick. Many coaches refer to this as a “Hedge”. But I like the term “Show” as it entails that you are quickly stepping out and showing yourself to the ball handler. As the ball handler begins coming off, the big needs to meet him at the level of the screen and force him to take at least two back dribbles toward half-court; this will give your guard time to recover. As the guard recovers, he will go over top of the pick, but under the big. A key point to Showing is communication, the guard needs to communicate to his big when he is back; last thing you want is the big to leave the ball before the guard has fully recovered. Now that you have all of these concepts you may be asking, which one is the most effective? That all depends on your game plan, personnel, and time & score. Nevertheless, E.L.C. needs to be enforced in every situation!